Power through your busy morning by fueling up with this quick, 6 ingredient oatmeal breakfast with fresh berries. Boost your nutritional intake of fiber and Omega-3 fatty acids by adding a ground chia and flaxseed blend. 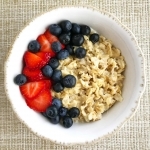 In a large microwave safe bowl, combine the rolled oats and milk. Cook per the package’s instructions. Note: Adjust the milk quantity to change the thickness of the oatmeal. For a thicker oatmeal, use less milk and for a thinner oatmeal, use more milk. Once cooked, add the ground chia flax seed blend, walnuts, fresh berries and optional banana. Mix and enjoy immediately! Substitute a store bought blend with whole chia seeds and ground flaxseed, one tablespoon each. To grind whole flaxseeds: Use a spice/coffee grinder or a high-powdered blender to grind whole flaxseeds into a fine blend. Feel free to also grind the whole chia seeds, although not necessary. Store ground seed blends, whole chia seeds or whole flaxseeds in airtight containers and keep refrigerated.